This is what I really wanted to say in my last post! Please support the cause! These brothers and sisters are doing a great thing for those slackers scattered throughout the hip-hop/entertainment community. Please spread this video + message. 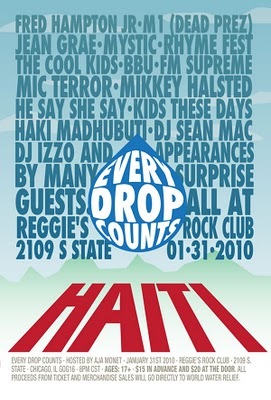 Every Drop Counts is a grassroots organization assembled in response to the recent devastating earthquake in Haiti. We began by establishing a Hip-Hop and soul benefit concert—scheduled to take place in Chicago on Sunday, January 31, 2010. The benefit is meant to create awareness of the fundamental need and human right to access clean water. Water is an essential resource to the vitality of human life, it engenders prolonged community building and development. We are partnering with local sponsors and non for profits to insure we maximize the urgency of survival in Haiti. Our primary partner in our efforts to facilitate the distribution of this critical resource to Haiti is the World Water Relief. Fred Hampton Jr., M1 [of Dead Prez], Jean Grae, Mystic, Rhyme Fest, The Cool Kids, BBU, FM Supreme, Mic Terror, Mikkey Halsted, He Say She Say, Kids These Days, Haki Madhubuti, DJ Sean Mac, DJ Izzo, and appearances by countless surprise guests. All proceeds from ticket and merchandise sales will go directly to World Water Relief, a Operating Division of Emergency Response Resources, Inc., a 501c3 charitable corporation whose mission is to deliver water filters to disaster areas and third world countries around the world. Clean water filters range anywhere from $4,000 to $4,500 a piece; WWR has agreed to match us up to $5,500. These water filters can produce one gallon of water per minute, providing immediate and long term use for a community of people.